Collect several blossoms of the Rose-of-Archon flower for Sapiarchs. The Divine Prosecution has tasked me to recover several blossoms of the Rose-Of-Archon flower, needed by Sapiarchs for their religious rites. 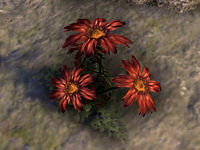 Travel to the Archon's Grove and collect the flowers. "The Divine Prosecution has been tasked to recover Rose-Of-Archon blossoms on behalf of the Sapiarchs. Not life threatening perhaps, but still of vital importance to several of their religious ceremonies. Well worth the risks, I assure you." "I'm afraid that Archon's Grove has been recently taken over by a pack of werewolves. Most dreadful, but the Divine Prosecution cannot reassign resources to manage the outbreak. You'll have to go in alone. Are you willing to take on this assignment?" I can collect the blossoms in Archon's Grove. Now travel to Archon's Grove. Here you need to collect 5 blossoms from Rose-of-Archon plants. The plants spawn on many locations inside the delve and are not unique to you, meaning anyone with the quest can pick them. "That was fast. I'm impressed! And you know what would impress me even more? If you tell me that you've successfully completed the contract." I've got some Rose-of-Archon blossoms. "Ah, very good! The Sapiarchs will be pleased to hear it. From what I've heard, their 58th Day of the Divine Reverence to Mara is soon to take place. These roses are vital to that ceremony! Your diligence is duly noted by the Divine Prosecution." I should travel to Archon's Grove and collect the blossoms. Finishes quest I've recovered the Rose-Of-Archon blossoms from Archon's Grove. I should return them to Justiciar Tanorian in Alinor. This page was last modified on 17 February 2019, at 20:21.